Located on the beautiful west end of Ocean Isle Beach. This top floor oceanfront condo, newly renovated throughout, features 3 bedrooms, 2 full baths, fully equipped kitchen, a private balcony, oceanfront swimming pool with direct access to the beach! Watch the sunrise and sunset, porpoises play, shrimp boats passing by, listen and watch the ocean waves and enjoy starry nights! New furniture, vinyl wood look flooring throughout, recently painted, completely remodeled bathrooms, including a marble tiled walk in master shower with glass tile accents! Sleeps 8 - Beds: King, Queen, Double/Twin Bunk and Twin. 3 Color Cable TVs, DVD, WiFi Internet, NetFlix. Newer appliances : Dishwasher, Electric Stove, Refrigerator, Microwave, Kuerig Pod Coffee Maker, Washer & Dryer, Ceiling Fans throughout. 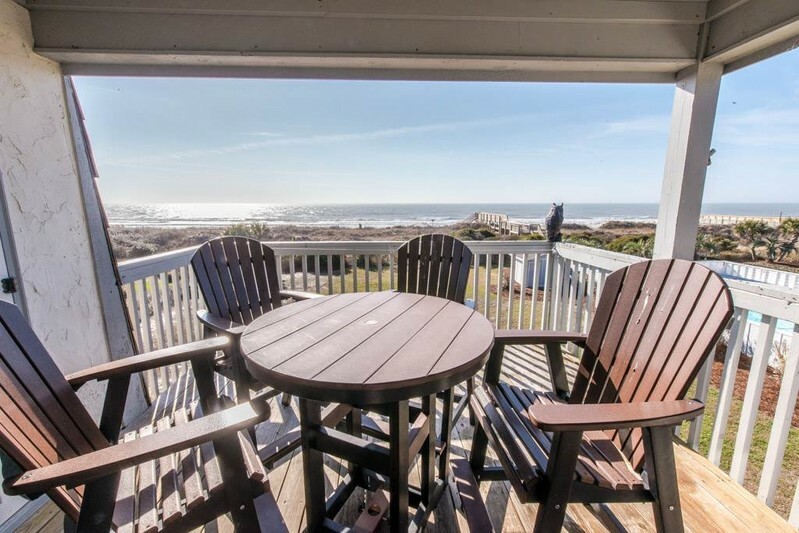 Central AC and Heat, Covered Deck and private oceanfront balcony with quality outdoor dining/furnishings. Unobstructed views of pool and ocean from the living room, master bedroom and oceanfront balcony. Beds made upon arrival and bath linens provided.